Crash Tanga is the oldest child in the Tanga Family. A man now, he is captain of a space ship called the Century Condor, a Deep Space Cruiser. Crash is accident prone, and has made a life out of living up to his name. Crash does yoga with his best friend Upside Downward Dog so he has less impact in the Universe. The role of Captain Crash Tanga is performed by actor Jeffrey Pufahl. Upside Downward Dog is Crash Tanga’s best friend and side kick. Dee Dee is also the pilot of the Century Condor because it is safer for everyone if Crash does not drive. Dee Dee is a Master of YOGA and loves to practice extreme poses in deep space. The role of Dee Dee is performed by actor / Yoga Teacher Vincent Lu. LOU LOU is the brain of the Century Condor. More than the ships onboard navigational system, LOU LOU has an encyclopedic knowledge of both the universe and yoga. LOU LOU instructs Crash, Dee Dee, and the Astronauts in Yoga and uses their concentration energy to solve problems in space. 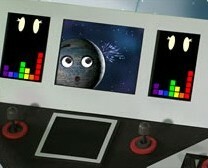 The role of Lou Lou the Space Computer is performed by actor Miranda Hughes. 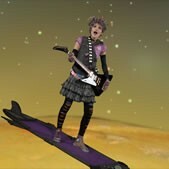 Flash Tanga is the fastest girl in the Solar System. Flash holds the record for the fastest speed running 5 laps of Saturn's Rings. The role of Flash Tanga is performed by actor Kirsten Holfeuer. Smash Tanga is the strongest in the Tanga Family. 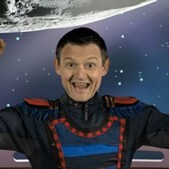 He loves to smash things and is known for practicing his baseball swing in the asteroid belt. The role of Smash Tanga is performed by actor / comedian Myles Morrison. Sash Tanga loves music, singing, and colors. She is known for playing her electric guitar and singing with the planets. The role of Sash Tanga is performed by actor / model Michaella Shannon. Clash Tanga loves to be different. He loves spicy foods and grows the Spiciest Radishes in the Solar System. The role of Clash Tanga is performed by actor / yoga teacher Ryan Leier. Beam aboard have fun with our games and downloads! Get Space Stretch For Your iPad! This playful app uses videos & games to encourage kids to engage in physical activity and active imagination to generate concentration and stretch energy. Young astronauts beam aboard a space ship that uses energy generated by stretching and physical activity to solve problems in the universe. Beam aboard and join the crew save the stars and planets too! 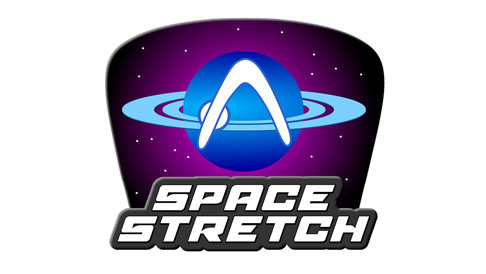 Space Stretch is a morning smoothie that blends live action, digital and stop motion animation, exercise and fun into an adventure that takes place aboard The Century Condor, a space ship with Captain Crash Tanga, his side-kick pilot Upside Downward Dog (Dee Dee), and LOU LOU Space Computer. Crash, Dee Dee and his crew do yoga stretches and balances on board the Condor as they explore the universe and fix any disturbances they happen upon. 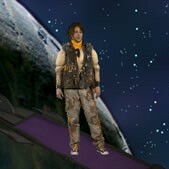 Crash and his crew do yoga stretches and balances on-board the Condor as they travel to, explore, and solve unusual disturbances taking place in the solar system. 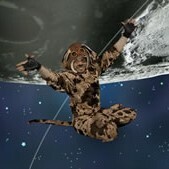 Let’s all stretch in space!